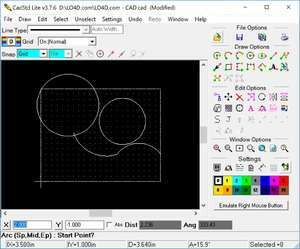 CadStd is a freeware alternative to CAD design programs like AutoDesk's famous AutoCAD program, though CadStd Lite only works in two dimensions. Like most two-dimensional design environments, CadStd Lite works with an array of geometric objects like lines, circles, squares, arc, etc. The application allows you modify the objects, adjust them, modify dimensions and edit text. With CadStd Lite, you can export your drawings as DXF or copy them to the clipboard for use in other applications. Version 3.7.3 is a freeware program which does not have restrictions and it's free so it doesn't cost anything. For security reasons, you should also check out the CadStd Lite download at LO4D.com which includes virus and malware tests. Additional screenshots of this application download may be available, too.